Archery is a significant talent for every child in the tribal milieu. But it is said that if talent gets a master teacher, it can shine brighter. 15 years ago, the taluka of village Shiva Tarai, 70km away from Bilaspur, got such a guru - Head Constable Itwari Raj Singh. It is the result of his dedication that within eight years, the players here have won a total of 122 medals. Every child is eager to become a champion and maintaining the same enthusiasm, they practice in order to achieve the goal. This enthusiasm of children is directly related to the passion of Itwari. He never hesitated to put his salary at stake to raise resources for archery. He even took loan, but never let children down. Head constable of the Chhattisgarh police, Itwari Raj Singh, has made the village recognized on a national level. He encouraged the unemployed youth of the village for playing sports. He spent money on the game from his paycheck. When they fell short of resources, he even took loans. With that money, he arranged for bows and arrows for the children. First, he started giving training of archery to just four children of the village. Today, the children of the entire village are being trained by him. The village has a population of 1500 and most of the children dream of becoming champions. Many have even fulfilled their dream. They have won gold, silver and bronze medals in various events. 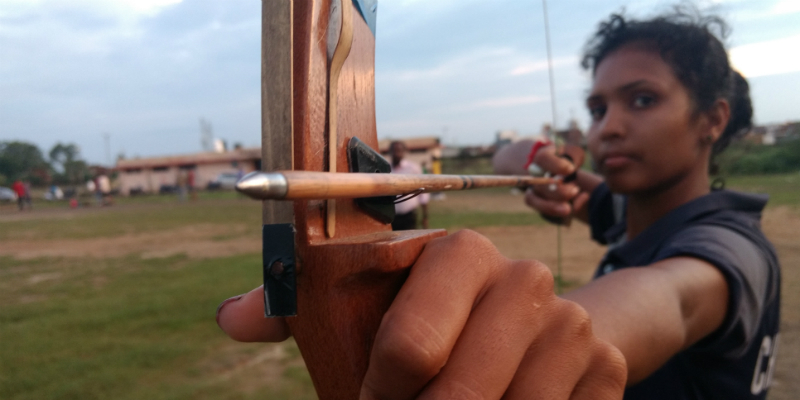 Given the talent of the children here, Raipur Center of the Sports Authority of India had arranged for a special trial of archery. 35 participants took part in it and 10 were elected. The selected players joined the SAI centre. This was the first time in SAI’s history when a complete team of SAI Center was sent for the trial to any village. Itawari had started teaching children as a hobby. When medals started to roll in from competitions, this hobby became passion. Thus began the journey of becoming a champion. After utilizing his salary, he took a loan of 50,000 rupees to raise the resources. At present, he has 35 sets of bows and arrows. Itwari's desire is to make Shiva Tarai recognised on the world map and that every person in Chhattisgarh should be proud of it. His son Abhilash Raj himself is an expert in this. Four players, including him, have also received Praveerchand Bhanjdev award, which is the biggest honor of archery in Chhattisgarh. Another player who has also received this award is Santram Bagga. On the basis of his performance, the government has also given Santram a job of peon in the school of Shiva Tarai. Apart from Santram, Bhagwat Parte and Khem Singh are also working in the Army on the basis of sports quotas. Shiva Tarai's Aghan Singh has also received Raja Praveerchand Bhanjdev award. At present, 50 boys and girls are being trained under mini, junior and senior categories at the Shiva Tarai school ground. Along with the villagers, Itwari himself is confident that in the coming days, names of Shiva Tarai players will definitely be counted among the best archers in the world. To make this a reality, they will continue doing everything possible and will keep enhancing their talent.